During this symposium a special session was dedicated to PROGRESS. 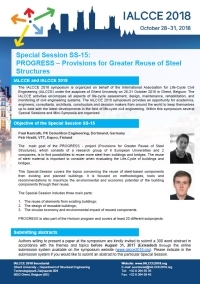 This special session covers the topics concerning the reuse of steel-based components from existing and planned buildings. It is focused on methodologies, tools and recommendations to maximize the environmental and economic potential of the building components through their reuse. 3. The circular economy and environmental impact of reused components. The Built Environment Lifecycle Thinking Clinic workshop was co-organized with the Finnish Environmental Institute (SYKE) on 13 February 2019 in Lahti. 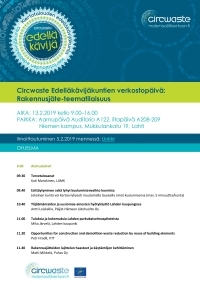 During this workshop, opportunities for CDW reduction by reuse of building elements were presented, and a CircWaste networking seminar was organized to present the PROGRESS project to the Finnish municipal representatives. The final workshop will be held in Belgium together with ECCREDI (European Council for Research, Development and Innovation in the Construction sector) member associations such as ACE (Architects Council of Europe), FIEC (Federarion of Construction Industries), ECCE (European Convention for Civil Engineers), and others in Brussels in June 2020.